This article is about the modern language spoken in northern Iraq and neighboring regions. For similarly named languages, see Assyrian language. Assyrian Neo-Aramaic or simply Assyrian (ܣܘܪܝܬ or ܣܘܪܬ, Sūreṯ), also known as Eastern Syriac, is a Neo-Aramaic language within the Semitic branch of the Afro-Asiatic language family that is largely spoken by Assyrian people. The various Assyrian Aramaic dialects, including Assyrian Neo-Aramaic, have been heavily influenced by--though not directly descended from--Classical Syriac, the Middle Aramaic dialect of Edessa, after its adoption as an official liturgical language, and they are ultimately also descended from Old Aramaic, the lingua franca in the later phase of the Neo-Assyrian Empire, displacing the East Semitic Assyrian dialect of Akkadian beginning around the 10th century BC. Northern Iraq, western Iranian Azerbaijan and Kurdistan, northeast Syria near the Turkish border. Extinct in Turkey. Parts of southern Armenia. Assyrian Neo-Aramaic is spoken by an estimated 200,000 people who are native to Upper Mesopotamia, which is a large region stretching from the plain of Urmia in northwestern Iran to the Nineveh plains, and the Erbil, Kirkuk and Duhok regions in northern Iraq, together with the Al-Hasakah region of northeastern Syria, and parts of southeastern Turkey. Instability throughout the Middle East over the past century has led to a worldwide diaspora of Assyrian speakers, with many speakers now living abroad in such places as North America, Australia and Europe. Speakers of Assyrian Neo-Aramaic, Chaldean Neo-Aramaic and Turoyo are ethnic Assyrians and are descendants of the ancient Assyrian inhabitants of Northern Mesopotamia. Assyrian Neo-Aramaic is one of the largest Neo-Aramaic languages (232,000 speakers), with Chaldean Neo-Aramaic (213,000 speakers) and Turoyo (250,000 speakers) making up most of the remaining Neo-Aramaic speakers. Despite the terms "Chaldean Neo-Aramaic" and "Assyrian Neo-Aramaic" indicating a separate ethnoreligious identity, both the languages and their native speakers originate from the same Upper Mesopotamian region (historic Assyria). Nonetheless, all these languages evolve from Aramaic, which was, along with Latin and Greek, one of "the three most important Christian languages in the early centuries" of the Common Era. Assyrian Neo-Aramaic is, to a significant degree, mutually intelligible with Chaldean Neo-Aramaic and they are sometimes considered to constitute dialects of the same language rather than two separate languages. To a moderate degree, Assyrian is also intelligible with Senaya, Lishana Deni and Bohtan Neo-Aramaic (which are, at times, also considered to be dialects of the same language), and is partially intelligible with Lishan Didan, Hulaulá and Lishanid Noshan. Its mutual intelligibility with Turoyo, a Central Neo-Aramaic language, is partial and asymmetrical, but more significant in written form. Evolved in the 13th century from Middle Aramaic, Assyrian Neo-Aramaic is a moderately-inflected, fusional language with a two-gender noun system and rather flexible word order. There is some Akkadian influence in the language. In its native region, speakers may use Iranian, Turkic and Arabic loanwords, while diaspora communities may use loanwords borrowed from the languages of their respective countries. Assyrian Neo-Aramaic is written from right-to-left and it uses the Madnhāyā version of the Syriac alphabet. Assyrian, alongside other modern Aramaic languages, is now considered endangered. Aramaic was the language of commerce, trade and communication and became the vernacular language of Assyria in the late Iron Age and classical antiquity. It became the lingua franca of the Neo-Assyrian Empire (911–605 BC), Neo-Babylonian Empire (605–539 BC), the Achaemenid Empire (539–323 BC), the Parthian Empire (247 BC–224 AD), and the Sasanian Empire (224–651 AD). Aramaic writing has been found as far north as Hadrians Wall in Ancient Britain, in the form of inscriptions in Aramaic, made by Assyrian and Aramean soldiers serving in the Roman Legions in northern England during the 2nd century AD. The Assyrian Empire resorted to a policy of deporting troublesome conquered peoples (predominantly fellow Semitic Aramean tribes as well as many Jews) into the lands of Mesopotamia. By the 6th century, the indigenous and originally Akkadian-speaking Semites of Assyria and Babylonia, spoke Akkadian-infused dialects of Eastern Aramaic. Consequently, during the Persian rule of Assyria, Aramaic gradually became the main language spoken by the Assyrians. Even before the Empire fell, Aramaic had become the lingua franca of its empire and Assyrians were capable of speaking both Akkadian and Aramaic. Local unwritten Aramaic dialects emerged from Imperial Aramaic in Assyria–northern Mesopotamia, an Akkadian-influenced version of the Old Aramaic language, which was introduced as the lingua franca of the Neo-Assyrian Empire by Tiglath-Pileser III (745–727 BC). The first evidence of such dialects emerged in Assyria, and begin to influence the written Imperial Aramaic from the 5th century BC. Following the Achaemenid conquest of Assyria under Darius I, the Aramaic language was adopted as the "vehicle for written communication between the different regions of the vast empire with its different peoples and languages". After the conquest of Assyria by the Seleucid Empire in the late 4th century BC, Imperial Aramaic and other Aramaic dialects gradually lost their status as imperial languages but continued to flourish as lingua francas alongside Ancient Greek. By the 1st century AD, Akkadian was extinct, although some loaned vocabulary and grammatical features still survives in Assyrian Neo-Aramaic and other Assyrian languages to this day. The Neo-Aramaic languages evolved from Middle Aramaic by the 13th century. There is evidence that the drive for the adoption of Syriac was led by missionaries. Much literary effort was put into the production of an authoritative translation of the Bible into Syriac, the Peshitta (ܦܫܝܛܬܐ, Pšīṭtā). At the same time, Ephrem the Syrian was producing the most treasured collection of poetry and theology in the Classical Syriac language. By the 3rd century AD, churches in Edessa in the kingdom of Osroene began to use Syriac as the language of worship and the language became the literary and liturgical language of many churches in the Fertile Crescent. Syriac was the lingua franca of the Middle East until 900 AD, when it was superseded by Arabic in a centuries-long process having begun in the Arab conquests. The differences with the Church of the East led to the bitter Nestorian schism in the Syriac-speaking world. As a result of the schism as well as being split between living in the Byzantine Empire in the west and the Sasanian Empire in the east, Syriac developed distinctive western and eastern varieties. Although remaining a single language with a high level of comprehension between the varieties, the two employ distinctive variations in pronunciation and writing systems and, to a lesser degree, in vocabulary and grammar. The Mongol invasions of the 13th century and the religiously motivated massacres of Assyrians by Tamurlane further contributed to the rapid decline of the language. In many places outside of northern Mesopotamia (the Assyrian homeland), even in liturgy, the language was replaced by Arabic. The original Mesopotamian writing system, believed to be the world's oldest, was derived around 3600 BC from this method of keeping accounts. By the end of the 4th millennium BC, the Mesopotamians were using a triangular-shaped stylus made from a reed pressed into soft clay to record numbers. Around 2700 BC, cuneiform began to represent syllables of spoken Sumerian, a language isolate genetically unrelated to the Semitic and Indo-Iranian languages that it neighboured. About that time, Mesopotamian cuneiform became a general purpose writing system for logograms, syllables and numbers. This script was adapted to another Mesopotamian language, the East Semitic Akkadian (Assyrian and Babylonian) around 2600 BC. With the adoption of Aramaic as the lingua franca of the Neo-Assyrian Empire (911–609 BC), Old Aramaic was also adapted to Mesopotamian cuneiform. The last cuneiform scripts in Akkadian discovered thus far date from the 1st century AD. The Syriac script is a writing system primarily used to write the Syriac language from the 1st century AD. It is one of the Semitic abjads directly descending from the Aramaic alphabet and shares similarities with the Phoenician, Hebrew, Arabic, and the traditional Mongolian alphabets. The alphabet consists of 22 letters, all of which are consonants. It is a cursive script where some, but not all, letters connect within a word. The oldest and classical form of the alphabet is ʾEsṭrangēlā (ܐܣܛܪܢܓܠܐ); the name is thought to derive from the Greek adjective στρογγύλη (strongúlē) 'round'. Although ʾEsṭrangēlā is no longer used as the main script for writing Syriac, it has undergone some revival since the 10th century. When Arabic gradually began to be the dominant spoken language in the Fertile Crescent after the 7th century AD, texts were often written in Arabic with the Syriac script. Malayalam was also written with Syriac script and was called Suriyani Malayalam. Such non-Syriac languages written in Syriac script are called Garshuni or Karshuni. The Madnhāyā, or 'eastern', version formed as a form of shorthand developed from ʾEsṭrangēlā and progressed further as handwriting patterns changed. The Madnhāyā version also possesses optional vowel markings to help pronounce Syriac. Other names for the script include Swāḏāyā, 'conversational', often translated as "contemporary", reflecting its use in writing modern Neo-Aramaic. Ṭūḇayhōn l-ʾaylên da-ḏḵên b-lebbhōn, d-hennōn neḥzōn l-ʾǎlāhā. Three letters act as matres lectionis: rather than being a consonant, they indicate a vowel. ʾĀlep̄ (ܐ), the first letter, represents a glottal stop, but it can also indicate a vowel at the beginning or the end of a word. The letter Waw (ܘ) is the consonant w, but can also represent the vowels o and u. Likewise, the letter Yōḏ (ܝ) represents the consonant y, but it also stands for the vowels i and e. In addition to foreign sounds, a marking system is used to distinguish qūššāyā, 'hard' letters) from rūkkāḵā, 'soft' letters). The letters Bēṯ, Gāmal, Dālaṯ, Kāp̄, Pē, and Taw, all plosives ('hard'), are able to be spirantized into fricatives ('soft'). The system involves placing a single dot underneath the letter to give its 'soft' variant and a dot above the letter to give its 'hard' variant (though, in modern usage, no mark at all is usually used to indicate the 'hard' value). In the 1930s, following the state policy for minority languages of the Soviet Union, a Latin alphabet was developed and some material published. Despite the fact that this innovation did not displace the Syriac script, the usage of the Latin script in the Assyrian community has become rather widespread due to the Assyrian diaspora's settlement mostly being in Europe and the anglophone, where the Latin script dominates. The Latin alphabet is preferred by most Assyrians for practical reasons and its convenience, especially in social media, where it is used to communicate. Although the Syriac Latin alphabet contains diacritics, most Assyrians rarely utilize the modified letters and would conveniently rely on the basic Latin alphabet. The Latin alphabet is also a useful tool to present Assyrian terminology to anyone who is not familiar with the Syriac script. A precise transcription may not be necessary for native Assyrian speakers, as they would be able to pronounce words correctly, but it can be very helpful for those not quite familiar with Syriac and more informed with the Latin script. The pharyngeal /ʕ/, represented by the letter `e (ܥ), is a marginal phoneme that is generally upheld in formal or religious speech. Among the majority of Assyrian speakers, `e would be realized as [aɪ̯], [eɪ̯], [ɛ] or even geminating the previous consonant, depending on the dialect. However, the letter itself is still usually pronounced [ʕ]. /f/ is a phoneme only heard in the Tyari, Barwari and Chaldean dialects. In most of the other Assyrian varieties, it merges with /p/. [θ] and [ð] are strictly used in the Tyari, Barwari and Chaldean dialects, which respectively merge with /t/ and /d/ in standard Assyrian (Iraqi Koine/Urmian) and other Ashiret dialects. Furthermore, in the Upper Tyari dialects, /t/ is mostly palatalized and replaced with /ʃ/. As such, due to the palatalization, the word beta ("house") in standard Assyrian will be pronounced as beša. In the Marga dialect, the /t/ may at times be replaced with [s] (besa). In the Urmian dialect, /w/ has a widespread allophone: [ʋ] (it may vacillate to [v] for some speakers). In some Jilu speakers, /q/ may be uttered as [k]. As such, qalama ("pen") will be pronounced as kalama. /ɡ/ is affricated and thus pronounced as [d͡ʒ] in the Urmian and some Tyari dialects. Therefore, garma ("bone") in standard Assyrian will be uttered as jarma. /k/ may be affricated as [t͡ʃ] in Urmian and Nochiya speakers. So for example, kma ("how much/many?") will be pronounced as čma. /ɣ/ is a marginal phoneme that occurs in a few words, albeit only for some speakers (mainly those who speak Arabic as a second language). For others, it is realized as [x]. In some Tyari and Chaldean dialects /r/ may be realized as [ɹ] or [ɽ]. /ʒ/ is found only in foreign words (usually from Turkic or Iranian languages): e.g. žara, "poor, pitiful"; dižmin, "enemy"; pežgir, "towel". Some Urmian dialects may realize /k/ as [c]. In some speakers, a dental click (English "tsk") may be used para-linguistically as a negative response to a "yes or no" question. This feature is more common among those who still live in the homeland or in the Middle East, than those living in the diaspora. /a/, as commonly uttered in words like naša ("man") and nara ("river"), is central [ä] for many speakers. Though it is usually [a] in the Urmian and Nochiya dialects. For some Urmian and Jilu speakers, [æ] may be used instead. In those having a thicker Jilu dialect, this vowel is mostly fronted and raised to [ɛ]. In the Tyari and Barwari dialects, it is usually more back [ɑ]. /ɑ/, a long vowel, as heard in raba ("much"), may also be realised as [ɒ], depending on the speaker. It is more rounded and higher in the Urmian dialect, where it is realized as [ɔ]. /e/, heard in beta ("house") is generally diphthongized to [eɪ̯] in the Halmon dialect (a Lower Tyari tribe). To note, the [aj] diphthong is a vestigial trait of classical Syriac and thereby it may be used in formal speech as well, such as in liturgy and hymns. /e/, retained in Tyari, Barwari, Chaldean and Baz dialects, as in kēpa ("rock"), is raised to [i] kīpa in Urmian and some other dialects. /ə/ (a schwa), uttered in words like didwa ("housefly"), is mostly realized as [ɪ] in the Tyari and Barwari dialects. /u/, as in gura ("big"), may be realized as [ɔ] in the Tyari, Baz, Chaldean and Barwari dialects. The Urmian dialect may diphthongize it to [uj]. /o/, as in tora ("cow") may be diphthongized to [aw] in some Tyari, Barwari, Chaldean and Jilu dialects. /i/ or /e/ is usually realized as [ɪ]. Two basic diphthongs exist, namely /aj/ and /aw/. For some words, many dialects have converted them to [e] and [o] respectively. When it comes to plurals, a commonly used vowel alteration in Assyrian is shifting the final -a to -ē, so ṭēra ('bird') will be ṭērē ('birds') in its plural form. This morphology is called an apophony and it is exemplified in English as the internal vowel alternations that produce such related words as foot and feet. Iraqi Koine is a standard Assyrian dialect which emerged in the mid-20th century, being influenced by both Urmian and Hakkari dialects. Iraqi Koine, like the majority of the Assyrian dialects, realizes /w/ as [w] instead of [ʋ]. Iraqi Koine generally realizes the interdental fricatives /θ/, /ð/ in words like mata ("village") and rqada ("dancing") as alveolar stops [t], [d] respectively. Predominantly, /q/ in words like qalama ("pen") does not merge with /k/. The diphthong /aw/ in words like tawra ("bull"), as heard in most of Hakkari dialects, are realized as [oː]: tora. The /uj/ diphthong in zuyze ("money") is retained as [u]: zuze. Depending on the speaker, the velar stops /k/ and /ɡ/ may be affricated as [t͡ʃ] and [d͡ʒ] respectively. [t͡ʃ] in verbs like či'axla ("[she] eats") is retained as [k]: ki'axla. Post 2010, in Iraq, Assyrian Neo-Aramaic is mainly spoken in the Nineveh plains and the cities around Mosul, Duhok, Irbil and Kurkuk (magenta). Modern Assyrian is a null-subject language with both ergative morphology and a nominative-accusative system, and also features a pronoun drop to a significant degree. Like English and modern Hebrew, Assyrian largely lacks grammatical cases. The Semitic genitive, which a noun is possessed or modified by another noun or noun phrase, is expressed morphologically by the genitive morpheme -i (betī — 'my house'), indicating possession. Word stress bears a strong relationship to vowel length. A final vowel, long or short, may not be stressed, though one of the last three syllables may be stressed. As such, the last heavy syllable (containing a long vowel or ending in a consonant) is stressed. Gemination occurs in the language, as heard in words like libba ("heart") and šmayya ("sky"). Even though subject–verb–object (SVO) is the default sentence structure of Syriac, subject–object–verb (SOV), verb–subject–object (VSO), verb–object–subject (VOS), object–verb–subject (OVS) and object–subject–verb (OSV) are also commonly used word orders in modern Assyrian, namely due to inversion taking place, thus making Assyrian Neo-Aramaic a flexible language, akin to Latin and Greek. Due to language contact, Assyrian may share similar grammatical features with Farsi and Kurdish in the way they employ the negative copula in its full form before the verbal constituent and also with the negated forms of present perfect. Assyrian has an extensive number of Iranian loanwords (namely Persian and Kurdish) incorporated in its vocabulary and grammar, as well as some Arabic and English loanwords. That is because of its close geographical proximity to those languages. As a central Semitic language, Assyrian is closely related to Hebrew, Arabic, Mandaic, Western Neo-Aramaic and Mandean, and would bear similar grammar style to these languages. In Assyrian, personal pronouns have seven forms. In singular forms, the 2nd and 3rd have separate masculine and feminine forms, while the 1st (and, in some dialects, the 2nd person subject pronoun) do(es) not. The plural forms also lack gender distinction. Like all Semitic languages and the unrelated Insular Celtic languages, Assyrian uses inflected prepositions when it comes to personal pronouns – the preposition al ("on") inflects as ali ("on me"). Nouns carry grammatical gender (masculine or feminine). They can be either singular or plural in number (a very few can be dual, a vestigial trait of Old Aramaic). Almost all singular substantives (common nouns and adjectives) are suffixed with -ā in their lemma form--the main exception being foreign words, which do not always take the suffix. The three grammatical states present in Classical Syriac are no longer productive, only being used in a few set terms and phrases (for example, ܒܲܪ ܐ݇ܢܵܫܵܐ, bar nāšā, "man, person", literally "son of man"), with the emphatic state becoming the ordinary form of the noun. Adjectives always agree in gender and number with the nouns that they modify. In Assyrian Neo-Aramaic, most genitive relationships are built using the relative particle d-, used in the same way as English "of" (e.g. ܢܘܼܗܪܵܐ ܕܫܸܡܫܵܐ, nuhrā d-šimšā, "the light of the sun"). Though written as a prefix on the noun in the genitive, the modern spoken form occurs as a suffix on the head, with some dialects displaying final-obstruent devoicing (e.g. nuhr-id šimšā or nuhr-it šimšā). Finite verbs carry person, gender and number, as well as tense and conjugation. The non-finite verb forms are the gerund and the active and passive participles. Verb forms are marked for person (first, second or third), number (singular or plural), gender (masculine or feminine), mood (indicative, imperative, jussive or gerund) and voice (active or passive). Peal ܨܵܠܹܐ ṣālē "he goes down"
Pael ܡܨܲܠܹܐ mṣālē (classically, mṣallē) "he prostrates; prays"
Aphel ܡܲܨܠܹܐ maṣlē "he brings down; makes go down"
The particle [h]wā (ܗ݇ܘܵܐ) may follow verbal forms to indicate an action further in the past (e.g. ܨܵܠܹܐ ܗ݇ܘܵܐ, ṣālē [h]wā, "he used to go down"). Assyrian may also feature double negatives, such as in sentences like le yawin la zuze ("I won't give no money"). Common negation words include la, hič and čuh, depending on usage and dialect. Assyrian uses verbal inflections marking person and number. The suffix "-e" indicates a (usually masculine) plural (i.e. warda, "flower", becomes warde, "flowers"). Enclitic forms of personal pronouns are affixed to various parts of speech. As with object pronoun, all possessive pronouns are suffixes that are attached to the end of nouns to express possession similar to the English pronouns my, your, his, her, etc., which reflects the gender and plurality of the person or persons. This is a synthetic feature found in other Semitic languages, and also in unrelated languages such as Finnish (Uralic), Persian (Indo-European) and Turkish (Turkic), to name a few. Moreover, unlike many other languages, Assyrian has virtually no means of deriving words by adding prefixes or suffixes to words. Instead, they are formed according to a limited number of templates applied to roots. Modern Assyrian, unlike Arabic, but like Hebrew and Akkadian, has only "sound" plurals formed by means of a plural ending (i.e. no broken plurals formed by changing the word stem). As in all Semitic languages, some masculine nouns take the prototypically feminine plural ending (-tā). An unstressed -eh denotes a singular possessive form (masc. ), whereas a stressed -éh is a third person plural possessive. In native words, Assyrian Neo-Aramaic almost always stresses the penultimate syllable. Although Assyrian Neo-Aramaic, like all Semitic languages, is not a tonal language, it should be noted that a tonal stress is made on a plural possessive suffix -éh (i.e. dīyéh; "their") in the final vowel to tonally differentiate it from an unstressed -eh (i.e. dīyeh; "his"), which is a masculine singular possessive, with a standard stress pattern falling on the penult. The -eh used to denote a singular third person masculine possessive (e.g. bābeh, "his father"; aqleh, "his leg") is present in most of the traditional dialects in Hakkari and Nineveh Plains, but not for Urmian and Iraqi Koine speakers, who instead use -ū for possessive "his" (e.g. bābū, "his father"; aqlū, "his leg"), whilst retaining the stress in -éh for "their". This phenomenon however may not always be present, as some Hakkari speakers, especially those from Tyari and Barwar, would use analytic speech to denote possession. So, for instance, bābeh (literally, "father-his") would be uttered as bābā-id dīyeh (literally, "father-of his"). In Iraqi Koine and Urmian, the plural form and the third person plural possessive suffix of many words, such as wardeh and biyyeh ("flowers"/"eggs" and "their flower(s)"/"their eggs", respectively), would be homophones were it not for the varying, distinctive stress on the penult or ultima. When it comes to a determinative (like in English this, a, the, few, any, which, etc. ), Modern Assyrian generally has an absence of an article (English "the"), unlike other Semitic languages such as Arabic, which does use a definite article (Arabic: ال‎, al-). Demonstratives (āhā, āy/āw and ayyāhā/awwāhā translating to "this", "that" and "that one over there", respectively, demonstrating proximal, medial, and distal deixis) are commonly utilized instead (e.g. āhā betā, "this house"), which can have the sense of "the". An indefinite article ("a(n)") can mark definiteness if the word is a direct object (but not a subject) by using the prepositional prefix "l-" paired with the proper suffix (e.g. šāqil qālāmā, "he takes a pen" vs. šāqil-lāh qālāmā, "he takes the pen"). Partitive articles may be used in some speech (e.g. bayyīton xačča miyyā?, which translates to "do you [pl.] want some water?"). Furthermore, Ancient Aramaic had a definite article in the form of a suffix: "-ā" for generally masculine words and "-t(h)ā" (if the word already ends in -ā) for feminine. The definite forms were pallāxā for "the (male) worker" and pallāxtā for "the (female) worker". Beginning even in the Classical Syriac era, the definite form of the word became dominant and the definite sense of the word merged with the indefinite sense so that pālāxā became "a/the (male) worker" and pālaxtā became "a/the (female) worker." Most Assyrian Neo-Aramaic nouns and verbs are built from triconsonantal roots, which are a form of word formation in which the root is modified and which does not involve stringing morphemes together sequentially. Unlike Arabic, broken plurals are not present. Semitic languages typically utilize triconsonantal roots, forming a "grid" into which vowels may be inserted without affecting the basic root. Assyrian Neo-Aramaic has lost the perfect and imperfect morphological tenses common in other Semitic languages. The present tense is usually marked with the subject pronoun followed by the participle; however, such pronouns are usually omitted in the case of the third person. This use of the participle to mark the present tense is the most common of a number of compound tenses that can be used to express varying senses of tense and aspect. Although Aramaic has been a nominative-accusative language historically, split ergativity in Christian and Jewish Neo-Aramaic languages developed through interaction with ergative Iranian languages, such as Kurdish, which is spoken by the Muslim population of the region. Ergativity formed in the perfective aspect only (the imperfective aspect is nominative-accusative), whereas the subject, the original agent construction of the passive participle, was expressed as an oblique with dative case, and is presented by verb-agreement rather than case. The absolutive argument in transitive clauses is the syntactic object. Unique among the Semitic languages, the development of ergativity in northeastern Neo-Aramaic dialects involved the departure of original Aramaic tensed finite verbal forms. Thereafter, the active participle became the root of the modern Assyrian imperfective, while the passive participle evolved into the modern Assyrian perfective. The Extended-Ergative dialects, which include Iraqi Koine, Hakkari and Christian Urmian dialects, show the lowest state of ergativity and would mark unaccusative subjects and intransitive verbs in an ergative pattern. Furthermore, Assyrian dialects exhibiting a higher level of ergativity are mostly SOV, while the dialects displaying a lower degree of ergativity are generally SVO. Map of the Assyrian dialects. SIL Ethnologue distinguishes five dialect groups: Urmian, Northern, Central, Western, and Sapna, each with sub-dialects. Mutual intelligibility between the Assyrian dialects is as high as 80%–90%. The Urmia dialect has become the prestige dialect of Assyrian Neo-Aramaic after 1836, when that dialect was chosen by Justin Perkins, an American Presbyterian missionary, for the creation of a standard literary dialect of Assyrian. A second standard dialect derived from General Urmian known as "Iraqi Koine", developed in the 20th century. In 1852, Perkins's translation of the Bible into General Urmian was published by the American Bible Society with a parallel text of the Classical Syriac Peshitta. Sample of the Urmian dialect. Note the Persian influence on cadence and pronunciation, particularly the use of [v], [uj] and the frequency of [t͡ʃ]. Sample of the Tyari dialect. Notice the usage of [θ], [ð] and [aw]. Lower Tyari – Dialects of the Tyari group share features with both the Chaldean Neo-Aramaic dialects in Northern Iraq (below) and Urmian (above). Sample of the Chaldean dialect - Which is considered its own language in some regards. Notice the usage of [ħ] and [ʕ], which makes it similar sounding to the Western Aramaic languages (voice by Bishop Amel Shamon Nona). Sample of the Iraqi Koine dialect (voice by Linda George). Notice how it combines the phonetic features of the Hakkari (Turkey) and Urmian (Iran) dialects. Iraqi Koine, also known as Iraqi Assyrian and Standard Assyrian, is a compromise between the rural "Ashiret" accents of Hakkari and Nineveh Plains (listed above), and the former prestigious dialect in Urmia. Iraqi Koine does not really constitute a new dialect, but an incomplete merger of dialects, with some speakers sounding more Urmian, such as those from Habbaniya, and others more Hakkarian, such as those who immigrated from Northern Iraq. Koine is more analogous or similar to Urmian in terms of manner of articulation, place of articulation and its consonant cluster formations than it is to the Hakkari dialects, though it just lacks the regional Farsi influence in some consonants and vowels, as the front vowels in Urmian tend to be more fronted and the back ones more rounded. For an English accent equivalence, the difference between Iraqi Koine and Urmian dialect would be akin to the difference between Australian and New Zealand English. During the First World War, many Assyrians living in Ottoman Turkey were forced from their homes, and many of their descendants now live in Iraq. The relocation has led to the creation of this dialect. Iraqi Koine was developed in the urban areas of Iraq (i.e. Baghdad, Basra, Habbaniya and Kirkuk), which became the meccas for the rural Assyrian population. By the end of the 1950s, vast number of Assyrians started to speak Iraqi Koine. Today, Iraqi Koine is the predominant use of communication between the majority of the Assyrians from Iraqi cities and it is also used as the standard dialect in music and formal speech. Assyrian Neo-Aramaic has a rather slightly defined dialect continuum, starting from the Assyrian tribes in northern Iraq (e.g. Alqosh, Batnaya) and ending in Western Iran (Urmia). The dialects in Northern Iraq, such as those of Alqosh and Batnaya, would be minimally unintelligible to those in Western Iran. The dialects in Northern Iraq have a distinct phonetic system (such as the realization of /ħ/) and, as such, would be considered part of Chaldean Neo-Aramaic. Nearing the Iraqi-Turkey border, the Barwari and Tyari dialects are more "traditionally Assyrian" and would sound like those in the Hakkari province in Turkey. Furthermore, the Barwar and Tyari dialects are "transitional", acquiring both Assyrian and Chaldean phonetic features (though they do not use /ħ/). Gawar, Diz and Jilu are in the "centre" of the spectrum, which lie halfway between Tyari and Urmia, having features of both respective dialects, though still being distinct in their own manner. In Hakkari, going east (towards Iran), the Nochiya dialect would begin to sound distinct to the Tyari/Barwar dialects and more like the Urmian dialect in Urmia, Western Azerbaijan, containing a few Urmian features. The Urmian dialect, alongside Iraqi Koine, are considered to be 'Standard Assyrian', though Iraqi Koine is more widespread and has thus become the more common standard dialect in recent times. Both Koine and Urmian share phonetic characteristics with the Nochiya dialect to some degree. Early Syriac texts still date to the 2nd century, notably the Syriac Bible and the Diatesseron Gospel harmony. The bulk of Syriac literary production dates to between the 4th and 8th centuries. Classical Syriac literacy survives into the 9th century, though Syriac Christian authors in this period increasingly wrote in Arabic. The emergence of spoken Neo-Aramaic is conventionally dated to the 13th century, but a number of authors continued producing literary works in Syriac in the later medieval period. 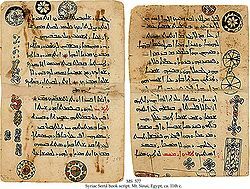 Because Assyrian Neo-Aramaic, alongside Turoyo, are one of the most widely spoken varieties of Syriac today, modern Syriac literature would therefore usually be written in those varieties. The conversion of the Mongols to Islam began a period of retreat and hardship for Syriac Christianity and its adherents, although there still has been a continuous stream of Syriac literature in Upper Mesopotamia and the Levant from the 14th century through to the present day. This has included the flourishing of literature from the various colloquial Eastern Aramaic Neo-Aramaic languages still spoken by Assyrian Christians. This Neo-Syriac literature bears a dual tradition: it continues the traditions of the Syriac literature of the past, and it incorporates a converging stream of the less homogeneous spoken language. The first such flourishing of Neo-Syriac was the seventeenth century literature of the School of Alqosh, in northern Iraq. This literature led to the establishment of Assyrian Neo-Aramaic and so called Chaldean Neo-Aramaic as written literary languages. In the nineteenth century, printing presses were established in Urmia, in northern Iran. This led to the establishment of the 'General Urmian' dialect of Assyrian Neo-Aramaic as the standard in much Neo-Syriac Assyrian literature up until the 20th century. The Urmia Bible, published in 1852 by Justin Perkins was based on the Peshitta, where it included a parallel translation in the Urmian dialect. The comparative ease of modern publishing methods has encouraged other colloquial Neo-Aramaic languages, like Turoyo, to begin to produce literature. ^ Hammarström, Harald; Forkel, Robert; Haspelmath, Martin, eds. (2017). "Assyrian Neo-Aramaic". Glottolog 3.0. Jena, Germany: Max Planck Institute for the Science of Human History. ^ a b Nordhoff, Sebastian; Hammarström, Harald; Forkel, Robert; Haspelmath, Martin, eds. (2013). "Northeastern Neo-Aramaic". Glottolog 2.2. Leipzig: Max Planck Institute for Evolutionary Anthropology. ^ * MacDonald, Kevin (2004-07-29). "Socialization for Ingroup Identity among Assyrians in the United States". Paper presented at a symposium on socialization for ingroup identity at the meetings of the International Society for Human Ethology, Ghent, Belgium. Archived from the original on 2007-06-10. Based on interviews with community informants, this paper explores socialization for ingroup identity and endogamy among Assyrians in the United States. The Assyrians descent from the population of ancient Assyria (founded in the 24th century BC), and have lived as a linguistic, political, religious, and ethnic minority in Iraq, Iran, Syria and Turkey since the fall of the Assyrian Empire in 608 BC. Practices that maintain ethnic and cultural continuity in the Near East, the United States and elsewhere include language and residential patterns, ethnically based Christian churches characterized by unique holidays and rites, and culturally specific practices related to life-cycle events and food preparation. The interviews probe parental attitudes and practices related to ethnic identity and encouragement of endogamy. Results are being analyzed. ^ Tekoglu, R. & Lemaire, A. (2000). La bilingue royale louvito-phénicienne de Çineköy. Comptes rendus de l’Académie des inscriptions, et belleslettres, année 2000, 960-1006. ^ Tezel, Aziz (2003). Comparative Etymological Studies in the Western Neo-Syriac (Ṭūrōyo) Lexicon: with special reference to homonyms, related words and borrowings with cultural signification. Uppsala Universitet. ISBN 91-554-5555-7. ^ The Nestorians and their Rituals; George Percy Badger. ^ A Short History of Syriac Christianity; W. Stewart McCullough. ^ Naby, Eden. "From Lingua Franca to Endangered Language". Assyrian International News Agency. ^ "Microsoft Word - PeshittaNewTestament.doc" (PDF). Archived from the original (PDF) on 2 December 2008. Retrieved 2008-11-16. ^ Parpola, Simo (2004). "National and Ethnic Identity in the Neo-Assyrian Empire and Assyrian Identity in Post-Empire Times" (PDF). Journal of Assyrian Academic Studies. JAAS. 18 (2). Archived from the original (PDF) on 2011-07-17. ^ Sabar, Yona (1975). "The impact of Israeli Hebrew on the Neo-Aramaic dialect of the Kurdish Jews of Zakho: a case of language shift". Hebrew Union College Annual (46): 489–508. ^ Odisho, Edward Y. (2001). „ADM’s educational policy: A serious project of Assyrian language maintenance and revitalization “, Journal of Assyrian Academic Studies, XV/1:3-31. ^ "Syriac alphabet". Encyclopædia Britannica Online. Retrieved June 16, 2012. ^ Hatch, William (1946). An album of dated Syriac manuscripts. Boston: The American Academy of Arts and Sciences, reprinted in 2002 by Gorgias Press. p. 24. ISBN 1-931956-53-7. ^ Nestle, Eberhard (1888). Syrische Grammatik mit Litteratur, Chrestomathie und Glossar. Berlin: H. Reuther's Verlagsbuchhandlung. [translated to English as Syriac grammar with bibliography, chrestomathy and glossary, by R. S. Kennedy. London: Williams & Norgate 1889. p. 5]. ^ Thackston, Wheeler M. (1999). Introduction to Syriac. Bethesda, MD: Ibex Publishers, Inc. ISBN 0-936347-98-8. ^ Coakley, J. F. (2002). Robinson's paradigms and exercises in Syriac grammar (5th ed.). Oxford University Press. p. 141. ISBN 978-0-19-926129-1. ^ Phillips, George (1866). A Syriac Grammar. Cambridge: Deighton, Bell, & Co.; London: Bell & Daldy. ^ Friedrich, Johannes (1959). "Neusyrisches in Lateinschrift aus der Sowjetunion". Zeitschrift der Deutschen Morgenländischen Gesellschaft (in German) (109): 50–81. ^ Moscati, Sabatino, et al. The Comparative Grammar of Semitic Languages. Harrassowitz, Wiesbaden, Germany, 1980. ^ Polotsky, Hans Jakob (1961). "Studies in Modern Syriac". Journal of Semitic Studies. 6 (1): 1–32. ^ Rudder, Joshua. Learn to Write Aramaic: A Step-by-Step Approach to the Historical & Modern Scripts. n.p. : CreateSpace Independent Publishing Platform, 2011. 220 pp. ISBN 978-1461021421 Includes the Estrangela (pp. 59–113), Madnhaya (pp. 191–206), and the Western Serto (pp. 173–190) scripts. ^ "Aramaic". The Eerdmans Bible Dictionary. Grand Rapids, Michigan, USA: William B Eerdmans. 1975. ISBN 0-8028-2402-1. ^ Tsereteli, Konstantin G. (1990). „The velar spirant 0 in modern East Aramaic Dialects“, W. Heinrichs (ed. ): Studies in Neo-Aramaic (Harvard Semitic Studies 36), Atlanta, 35-42. ^ *Beyer, Klaus (1986). The Aramaic language: its distribution and subdivisions. Göttingen: Vandenhoeck und Ruprecht. ISBN 3-525-53573-2. ^ Tsereteli, Konstantin G. (1972). „The Aramaic dialects of Iraq“, Annali dell’Istituto Ori-entale di Napoli 32 (n. s. 22):245-250. ^ Sabar, Yona (2003). "Aramaic, once a great language, now on the verge of extinction," in When Languages Collide: Perspectives on Language Conflict, Language Competition, and Language Coexistence, Joseph, DeStefano, Jacobs, Lehiste, eds. The Ohio State University Press. ^ Jaeggli, Osvaldo, and Ken Safir (1989) The Null Subject Parameter. Dordrecht: Kluwer. ^ Healey, John F (1980). First studies in Syriac. University of Birmingham/Sheffield Academic Press. ISBN 0-7044-0390-0. ^ Geoffrey Khan (16 June 2016). The Neo-Aramaic Dialect of the Assyrian Christians of Urmi (4 vols). BRILL. pp. 138–. ISBN 978-90-04-31393-4. ^ 8 Cf. M. Tomal, Studies in Neo-Aramaic Tenses, Kraków 2008, pp. 108 and 120. ^ Younansardaroud, Helen, Synharmonism in the Särdä:rïd Dialect, Journal of Assyrian Academic Studies 12:1 (1998): 77-82. ^ Bresnan, Joan (ed.) (1982) The Mental Representation of Grammatical Relations, MIT Press, Cambridge, Massachusetts. ^ Goldenberg, G. 2002 ‘Early Neo-Aramaic and Present-day dialectal diversity’. Journal of Semitic Studies XLV: 69-89. ^ Zwicky, Arnold M. "Clitics and Particles." Language 61.2 (1985): 283-305. Print. ^ Solomon, Zomaya S. (1997). Functional and other exotic sentences in Assyrian Aramaic, Journal of Assyrian Academic Studies, XI/2:44-69. ^ Cf. G. Khan, Ergativity in North Eastern Neo-Aramaic Dialects in: Alter Orient und Altes Testament. Studies in Semitics and General Linguistics Honor of Gideon Goldenberg, (334) 2007, pp. 147–157. ^ Ura, Hiroyuki. 2006. A Parametric Syntax of Aspectually Conditioned Split-ergativity. In Alana Johns, Diane Massam, and Juvenal Ndayiragije (eds.) Ergativity: Emerging issues. Dordrecht: Springer. 111-141. ^ A. Mengozzi, Neo-Aramaic and the So-called Decay of Ergativity in Kurdish, in: Proceedings of the 10th Meeting of Hamito-Semitic (Afroasiatic) Linguistics (Florence, 18–20 April 2005), Dipartamento di Linguistica Università di Firenze 2005, pp. 239–256. ^ Nash, Lea. 1996. The Internal Ergative Subject Hypothesis. Proceedings of NELS 26: 195-210. ^ Alexiadou, Artemis. 2001. Functional Structure in Nominals: Nominalization and Ergativity. Amsterdam: John Benjamins. ^ Hoberman, Robert. 1989. The Syntax and Semantics of Verb Morphology in Modern Aramaic: A Jewish Dialect of Iraqi Kurdistan. New Haven: American Oriental Society. ^ Doron, Edit. 2003. Agency and Voice: the Semantics of the Semitic templates. Natural Language Semantics 11 (1): 1-67. ^ a b Rev. Justin Perkins : “A residence of eight years in Persia among the Nestorian Christians”, New York, 1843 – P: 304. ^ Brock, Sebastian P. (1996). Syriac Studies: A Classified Bibliography, 1960-1990. Kaslik: Parole de l'Orient. ^ Brock, Sebastian P. (1992). Studies in Syriac Christianity: History, Literature, and Theology. Aldershot: Variorum. ^ Brock, Sebastian P. (2006). Fire from Heaven: Studies in Syriac Theology and Liturgy. Aldershot: Ashgate. For a list of words relating to Assyrian Neo-Aramaic, see the Assyrian Neo-Aramaic category of words in Wiktionary, the free dictionary.